My mother gets up when it's still dark out and goes to work in the city. Sometimes I hear her in the mornings, getting ready down the hall. Her alarm clock goes off in the living room, since that's where she sleeps now that Dad moved out. I know that she gets in the shower right away because I hear the sound of rushing water in the pipes, but I usually go back to sleep until she goes into the kitchen for coffee. I smell the bitter-warm scent and hear her high-heeled shoes—clack, clack, clack—across the tile floor, and that's what wakes me up again. I always look down at the bottom bunk to see if my little sister, Nan, is awake too, but she never is, so I stare at the ceiling, not very far above me, and listen in the dark to my mother's shoes. After she leaves, she won't be home for a long time, and when she does come home, she'll be pale and tired, and smell like paper. Clack, clack, clack, across the floor, louder this time, more on purpose, and I know that she's heading for the door. When her shoes sound like that, I always hold on to my pillow and try to think about how I'm eight now, and I try not to yell out to keep her from leaving. Sometimes I do, though, and I pretend I have just woken from a bad dream. She opens the door a bit and the light from the hallway makes a triangle on the carpet, and she tells me that it was just a dream and to go back to sleep and she'll see me after work. Mostly, though, I just listen. It's summer now, and Nan and I stay home with Elise, our older sister. She's 15, so that's old enough to watch your younger sisters. She doesn't really watch us, though, because we spend most of the day in the woods behind our house while she stays inside and talks on the phone. The thunderstorm last week knocked down four trees, and I make huts next to them, like the Native Americans I read about in Mrs. Hall's class. Nan doesn't always do a good job of finding big enough sticks, but she's only five. Once she found a bird's nest, just the size of my hands when I clasp them together, with four tiny, bald baby birds looking up at us with their beaks open. My mother always comes home from work late, but this summer she's been coming home even later. Sometimes she doesn't even come home at all, and Elise said it's because Gram is dying. Does she stay in the hospital with Gram? I ask, and Elise tells me that she stays with Aunt Louise in the city, because that's where Gram is. I ask why Gram isn't in the hospital anymore and Elise tells me it's because she's dying, but I'm not allowed to tell Nan. I know that Elise is 15, but I don't really think that Gram will die. I never really saw her a lot, but every time I did, she was sick. She's probably been sick forever, and she hasn't died from it in all this time. I think she'll just keep on being sick. If she does die, though, she should wait until the school year starts, because Danielle Silverman got to miss three whole days of school when her grandma died. On the nights when my mother doesn't come home, she always calls and talks to Elise. I want to talk to my mother, and Elise never lets me, but when she gets off the phone she's really nice to me and Nan, and she usually makes us something great for dinner, like French toast. Sometimes we all go next door for dinner at Miss Pam's house. I like that, too, because she has three cats who rub their bushy tails against my legs. Once, Miss Pam looked at us the same way Mrs. Hall used to look at Danielle Silverman when she would cry in class, and that's when I thought that maybe Gram really was dying. I wish my mother would come home more often. Sometimes in the mornings, I can hear her opening and closing her dresser drawers in the big bedroom she used to share with Dad. I know she's packing her overnight bag, and I know she won't be home that night. Elise says that she goes to Aunt Louise's apartment right after work so she can be with Gram. She says it like it's really important, more important than going to work, but I don't understand why because even I know that if Gram dies, she'll do it whether my mother is there or not, and Elise and Nan and me are alive so why doesn't she just come home? One morning, I heard my mother's shoes, and instead of calling out for her, I climbed down from my bunk bed and went to the kitchen. She was sitting at the table, dressed for work, and holding her coffee mug, but she wasn't drinking. Instead, she was looking out the window. She looked tired and white, like she had just woken up, even though I knew her alarm clock had gone off a long time ago. "Mama," I said, and she looked up like I had surprised her. "Mama, how long will it take for Gram to die?" "I don't know sweetie," she said, and told me to sit at the kitchen table with her. She poured me a bowl of cereal, and I ate breakfast with my mother. After a while, I asked if she was staying at Aunt Louise's tonight and she looked at me for a minute and said no, like she had just decided it, right then. That day I dug holes in the dirt in the woods with Nan and picked onion-grass and checked on the baby birds. They were getting bigger and were covered with soft-looking gray fuzz. They made a lot of noise now, and they were moving more. I told Elise about the birds, and she came out of the house and looked at them, too. In the afternoon, my mother called to talk to Elise, and I knew that meant she wouldn't be coming home. I was sick of eating French toast for dinner and I didn't want to go to Miss Pam's anymore, and I hated that the days were so long when Mama didn't come home. I started to cry and Elise let me talk to my mother. "You lied," I sobbed. "You spend all your time at Aunt Louise's and you never come home and I wish Gram would just die!" My mother started to cry, too, and I stopped crying because I was angry and started to cry because I was scared; my mother never cried. I went to my room and stayed there the whole night. In the morning I got up before either Elise or Nan was awake and went out to the woods by myself, even though I know I'm not supposed to go outside without telling anyone. I wore my flip-flops, and the dew from the grass got on my feet and made the dirt from the woods stick to them, and it felt grainy between my toes. I wandered over to the honeysuckle bushes that grew along the fence and slid the long, silvery threads out of the end of the flowers and tasted the sweet drop of nectar that I found there. Then I went to check on the baby birds. As I got closer, the mother bird flew out of her nest, and I looked inside so I could see the four little, orange, diamond-shaped mouths pointing up at me. When I looked, though, I only saw three. I kept on looking, trying to see in between the three grey fuzzy things, to see if the fourth baby bird was there. I thought maybe the others were sitting on it, so I knelt down to pick up a twig to scoot them apart, and then I saw it. 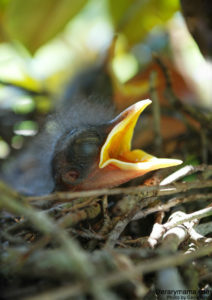 The tiny, delicate, grey fuzz-covered baby bird was on the ground under the nest, dead. Its thin wings were spread apart, and its tiny head was turned sharply to the side, its neck broken from the fall. I could almost see the outline of its frail bones beneath the soft down. I remembered how, just the day before, Nan and Elise and I had looked into the nest and smiled down on the birds, all four of them, as they reached their necks up at us, mouths wide. I remembered the loudness of their chirping, how, just the day before, they had all been living. I knew I wasn't supposed to touch baby birds because the mother might smell my scent on them and abandon them, but I also knew that this one was dead, and it didn't matter anymore. I bent down and picked up that baby bird, and cradled its weightless body in my hands. I put my face down and felt its never-before touched fuzz against my cheek, and I cried because yesterday my mama's mother was living. Stacey Hohman McClain is a writer and teacher whose work has appeared in Away: Experiments in Travel and Telling. She lives in Charlotte, NC with her husband and son.